Sooriyan FM Sri Lanka Live Online . Listen over 100 Tamil FM Radio Stations Online . It is the Number 01 Tamil channel in Sri Lanka , a member of the Asia Broadcasting Corporation Private limited which is a Rayynor Silva Holdings company. It is the 1st private Tamil radio channel in Sri Lanka launched 18 years ago, is the market leader & the trend setter in Tamil radio . 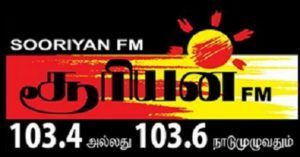 Sooriyan FM Live rated the number one Tamil radio channel as per the latest Listenership survey. Its innovative programming strategy and the up to date news reporting has made this FM the epitome in Tamil broadcasting. Address : Asia Broadcasting Corporation (Pvt) Ltd , 35th Floor, East Tower, World Trade Center,Colombo 01,Sri Lanka.